The kidney represents a major target for toxic xenobiotics due to its role in the control of body fluid and electrolyte homeostasis. The high blood perfusion rate (20% of cardiac output) and the capability to extract, metabolize, secrete and concentrate toxic compounds make the kidneys extremely vulnerable to a wide variety of toxins, many of which are yet to be identified. It is estimated that therapeutic agents cause 20% of all diagnosed end stage renal disease (ESRD) and that chemicals and drugs may play a significant role in at least 50% of ESRD cases of unknown etiology . Because of the functional and biochemical heterogeneity of the nephron, the susceptibility to a particular nephrotoxic insult will vary among nephron segments. 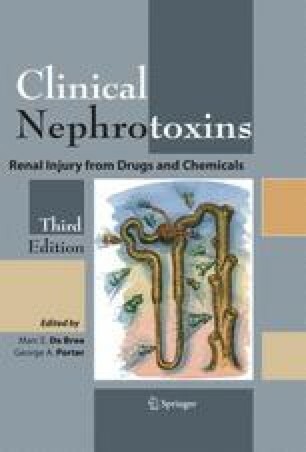 The epithelial cells of the proximal nephron are target sites for a wide variety of nephrotoxic chemicals due to a large number of transport systems  and the presence of xenobiotic metabolizing enzymes such as cytochrome P-450, NADPH-cytochrome c reductase, glucuronyl transferase, sulfotransferases, glutathione S-transferases, cysteine conjugate β-lyase, monooxygenases and prostaglandin H synthase . Another factor is the intracellular concentration of glutathione (GSH ) and GSH dependent enzyme activity, which is highest in proximal tubule and decreases progressively down the nephron [4, 5]. Additionally the proximal tubule has a high requirement for oxygen which makes this area of the nepron especially sensitive to oxygen deprivation .